All transactions are safe and secure with a reliable history in online purchasing behind each of our associates. 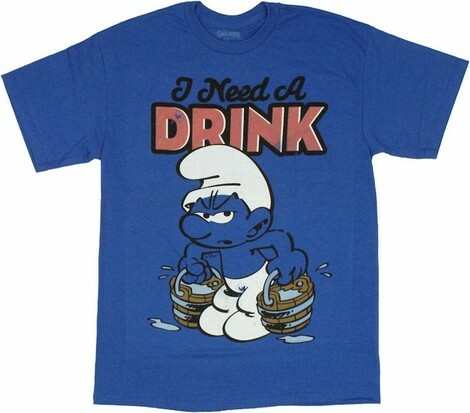 Buy the I Need a Drink Smurf t-shirt to own Smurfs clothing and merchandise. If you are looking for a grown up piece of Smurf clothing, then you have come to the right place. Of course, that depends on how you look at this design. Pair it with a Papa Smurf t-shirt for the perfect grown up combination. This bestselling item is available in a variety of sizes. If this item is not your style, then perhaps a pink Smurfette t-shirt is more your fancy. Wear it to play with plush Smurf toys and action figures or to watch the DVDs. In addition to the I Need a Drink Smurf tee above, browse the Smurfs Clothing Gallery for more apparel like men's and women's clothes, kids shirts or hoodies.